Sign up for Raising Children With Challenges now! Want to own the entire series to view any time? SPEAKER SCHEDULE MAY BE SUBJECT TO CHANGE. In this fast-paced conversation, Dr. Armstrong and I talk about the myriad ways we can revitalize our children’s spirits and motivation, emphasizing their strength rather than their challenge, including school alternatives when a traditional classroom isn’t working for your child. I had so much fun talking with Dr. Cohen: lots of laughter mixed with practical suggestions for helping children who struggle with anxiety. The first thing you’ll hear is why you should spend no more than five minutes trying to verbally reassure an anxious child. Instead, you’ll discover what does work when a child is fearful. Dr. Bertin brings a wealth of knowledge to our conversation. First, he shares a simple question that can help parents decide whether to seek out an evaluation when a child is having trouble, offering options for how to get help. Dr. Bertin shares ideas for bringing mindfulness into our children’s lives, and shares guidance for strengthening resilience and self-regulation. What fun I had in this stimulating conversation! Dr. Hallowell sees ADHD as a trait that can foster creativity, spontaneity, and tremendous achievements by those who have it. You’ll hear him explain what’s going on in the ADD brain and why “deficit” or “disorder” are so inaccurate when describing it. He also shares three great tips for helping worriers. Carol does a beautiful job explaining issues like Sensory Processing Disorder and what why sensory input like sound, light, proximity, and heat get garbled in the nervous system. She shares terrific ideas for helping children with ADHD, SPD or simply quirky characteristics. A great conversation! Rather than focusing on labels, Dr. Greene pays attention to identifying unsolved problems and unmet expectations. He does a beautiful job of introducing us to a model of collaboratively solving problems with our children rather than overpowering them, developing empathy while addressing chronic issues of defiance or meltdowns at their root. An outstanding dialogue! Dr. Axness lays out a simple way of better understanding the brain and its role in helping children integrate, relate, and regulate. She talks about the essential elements of attachment and warmth in the child, and emphasizes the importance of dependency and meeting each child’s unique needs–and how it’s never too late! My life was enormously impacted when I stumbled on the book, The Highly Sensitive Person, twenty or more years ago so it was a thrill to speak with Dr. Aron about her work. If you have a sensitive child who gets easily overwhelmed by bright lights or loud noises, is viewed as shy or timid, or seems to feel things more deeply than others, please don’t miss this special conversation. High sensitivity is a trait, not a disorder! Whether your youngster is on the Autism spectrum as Ted and Danise’s son, or has far simpler challenges, this powerful conversation is all about finding peace, joy, and celebration raising the child we have been given. With great heart and wonderful stories, you’ll get practical ideas blended with big doses of inspiration. Not to be missed! Patty begins our conversation by sharing the story of her sister who developed significant impairments after starting life out as a seemingly typically developing child. She understands firsthand how important it is for parents to have support, assistance, and a Listening Partner to help them offload the daily stresses and of raising children. I was moved me to tears as Billy Mann shared his story of coming to peace and gratitude for his family, just as it is. With two boys on the spectrum as well as two neurotypical daughters, Billy and his wife Gena have well-traveled the path of adjusting to their sons’ challenges and needs while helping their daughters accept their brothers’ quirks and differences. This interview is a love story about what is best about family. If you have a child with anxiety, please don’t miss this interview! Dr. Reznick shares highly practical tips for helping children learn to manage their fears–whether social anxiety, sleep issues, separation anxiety, or bigger worries like death. She even walks us through a gentle, calming visualization exercise that we can do with our children! Elaine Taylor Klaus, author, Parenting ADHD Now! There is so much richness in this conversation which a wide territory of topics related to helping differently wired children feel seen and celebrated. Debbie talks about how the pros and cons of labels and diagnoses, how to enlist allies among neurotypical peers, and helping children discover their unique gifts. Kerry was diagnosed with Autism at four, and is now an accomplished public speaker, the force behind a non-profit that provides college scholarships to kids on the spectrum, runs a mentorship program, and has authored books, including one with advice on finding love for people with autism. An uplifting, fascinating conversation with great information for all parents! I adore Maggie’s capacity for sharing loving, sensible advice for managing the bumps and tumbles of life with children. She talks about why we shouldn’t try to be perfect parents, offers suggestions for managing overwhelm, and shares inspiration for discovering the good and gorgeous in every single child. I adore talking with Rachel because she delivers such practical nuggets for managing life’s ups and downs. In this conversation, you’ll hear her reframe weaknesses as strengths (her daughter with distracted tendencies is a cherished “Noticer”), share how lists helped her special ed students, and challenge the impossible standards parents create for themselves. Jennifer is bubbly, bright, and full of heart as she shares stories of life with Asperger’s while offering practical strategies for celebrating children on the spectrum. She shares valuable indicators that a child’s quirkiness may warrant a diagnosis. You’ll better understand anyong in your life who is a little different by giving this a listen. This woman is a gentle but powerful force for families with children who are differently-wired. Whether it’s offering suggestions for kids who struggle with loud noises or sharing tips for kids who have a hard time socially, Cara offers hope and encouragement for helping children shine. You’ll get loads of ideas for helping children find greater regulation in this conversation with Susan. She shares great suggestions for helping restless, stressed, or overwhelmed children and teens find their calm center. And Susan makes it clear that Mindfulness includes movement–not just sitting still which isn’t easy for many children–or adults! 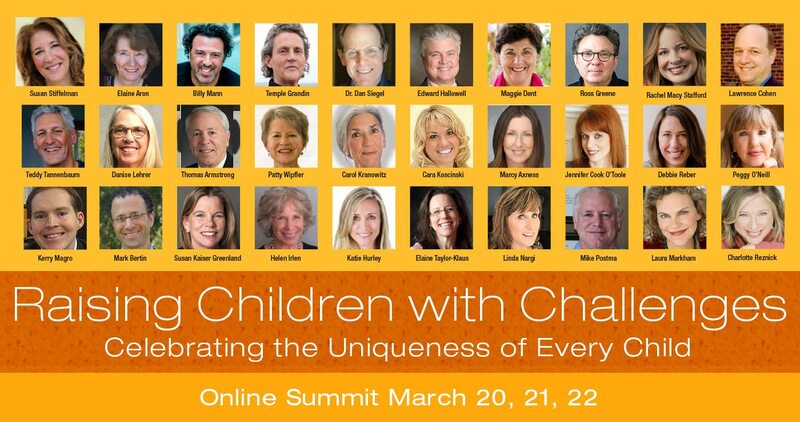 One of my hopes for this summit has been to provide a platform for people like Linda who help us recognize that every child brings unique gifts into our lives. Tune in to hear her talk about her wonderful daughters, and how she has helped them integrate into the classroom, and the world at large. In this wide-ranging conversation we cover a lot of territory: bullying, anxiety, and learning disabilities. Katie shares great tips for helping anxious children manage their worries, talks about how parents can coach socially awkward kids around friendship, and discusses accommodations for children with learning challenges. Lots of good advice here! Wow! If you’ve wondered why bright kids are sometimes socially awkward or your brilliant twelve year old acts like he’s seven if he loses a board game, tune in to this fast-paced discussion of the brain, development and behavior! Tons of information and great, practical tips. Absolutely fascinating and so important! Temple Grandin is a treasure, helping people understand autism with dedication and clarity. Our conversation covers a wide range of issues, always with tips and practical advice for parents that will help them support their children. I learned so much for talking with her, and am honored to share her words of wisdom with you! I met Helen when I went through training to become an Irlen screener years ago. Her work continues to fascinate me, especially when such a small adjustment–the overlays or tinted lenses–can make such a huge difference for those with learning difficulties, ADHD, sensory processing issues, migraines or spectrum disorders. Tune in to this fascinating conversations! Dr. Dan Siegel is a fountain of information and insight, and offers both in this riveting dialogue. He addresses the risks and limitations of labels, frames challenges as issues of integration, and shares a beautiful story of bonding with a child on the spectrum. Peggy has lived life in a body with limitations that might have made life difficult. Instead, she has embraced the adventure of living, from hiking the Grand Canyon to trekking in Bhutan. Tune in for joyful inspiration and practical ideas for raising children who refuse to be defined by their challenges. I always love my conversations with Dr. Laura Markham because everything she shares is wrapped in great kindness and compassion. Tune in as we talk about helping siblings manage their feelings when a brother or sister has “additional needs”, how to manage with our own big feelings when we’re overwhelmed or frustrated, and how to help kids with “additional needs” managing theirs. I want to own the series!